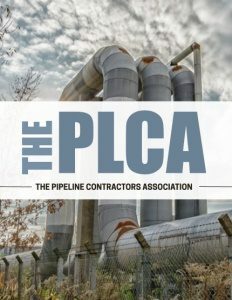 The Pipeline Contractors Association (PLCA) was established in 1948. It currently consists of 86 regular members and 90 associate members. The regular members are contractors that provide labor and equipment to build natural gas & oil pipelines and facilities throughout the United States. This process is complimented by our associate members who supply goods and services to our contractors and owner companies. Last, but not least, we have our honorary members. Since our inception in 1948, the PLCA has been blessed with the ability to recognize our 105 honorary members for their dedication and loyalty. We are very proud of their contributions to the pipeline industry. The PLCA is based out of Dallas, TX, and has been since 1948. The day-to-day business is managed by Pat Tielborg, our Managing Director and General Counsel. Mr. Tielborg has been leading our association for the past 40 years. In fact, his pipeline career started on the Alaska Pipeline in the early 1970s. Pat is supported in his role by Elizabeth Cyr Worrell, Chief Legal Counsel, Kevin Barrett, Executive Director, and Kerrie Horn, Office Administrator. One of the purposes of the PLCA is to maintain the standards of the pipeline contracting business at a level necessitated by its professional character and to establish members of the association in the public mind as contractors who fulfill obligations in good faith. The PLCA also works to promote cooperative relationships among pipeline contractors. The PLCA also seeks correction of discrimination by unfair business methods practiced against pipeline contractors. We encourage our members to work together to build a better industry by sharing best practices when it comes to safety, quality, and environmental stewardship. The PLCA is made up of many committees that follow through on the above-mentioned statement regarding our safety and quality commitment, and also by our training committees that are funded by the PLCA and operated and managed in conjunction with the four unions that are signatory to us. These four unions, who are our business partners, are the United Association of Plumbers and Pipefitters, the International Union of Operating Engineers, the Laborers International Union Association, and the International Brotherhood of Teamsters. The PLCA members and unions are signatory to an agreement that is called the National Pipeline Agreement. This agreement governs the construction of all mainline gas and/or oil transmission projects constructed by our members. This agreement is managed by the PLCA legal team and its counterparts from the unions. There are many committees that work behind the scenes to ensure that both organizations continue to operate under the principles they are committed to uphold. To sum it all up, the PLCA and our four union partners have an obligation to represent our members in accordance with the National Pipeline Agreement and the labor laws that govern this country, as well as provide a safe working environment, and work together to provide market share for our members. My role as President of the PLCA is to work with the staff and Board of Directors to verify compliance with the agreements while managing the best interests of the association. We’re over six months into the new administration and finally seeing Washington step up to the needs and demands of the energy business. A focus on energy independence and reliability is now getting the attention it needs. An aging infrastructure that served our nation well through the last several decades needs to be rebuilt. The shale plays within our borders need to be developed and brought to market to give us our independence and serve a growing economy. Although the Trump administration is working on these issues, they need our support to get there. The General Presidents of our four union partners visited the White House shortly after President Trump was sworn into office to address some of the issues like the constant delays in the regulatory process, the importance of getting projects permitted, and putting union members to work. It is efforts like these that make a difference. The unions and their members have worked hard to promote the pipeline industry by making their presence known and attending open houses in support of energy projects. These efforts by the unions, signatory contractors, and owner companies will make us all successful at the end of the day. Let’s face it: whether we like it or not, politics have made it to the forefront of our businesses, and the continuing efforts from the public and political affairs groups have become increasingly important. Enough about politics. Let’s talk about the future and what it holds in store for us. As I mentioned earlier, the aging infrastructure and continuous development of the shale plays bring a lot of opportunities to the pipeline industry. However, along with opportunities come challenges. The unions and their contractors must face up to these challenges together in order to get that proper lineup that’s necessary to succeed. One of the biggest challenges I see is the war on talent. The competition for the best talent is intensifying and we must all work together to build the workforce. We work in a great industry that provides excellent wages and benefits. I firmly believe that there is not another industry out there that can provide a young person the opportunities that the pipeline industry and the unions can offer. We must all continue to work together and recruit the best talent out there. We must encourage our new recruits to embrace the rapidly evolving technology. Every generation goes through change, even though we seem to hear and read more about the resistance of our workforce to welcome the change. If you think back to previous generations that came up through the trades, they all embraced change, but sometimes it took a while and this set us back. It is imperative that the current work force is willing to accept change so we don’t become stagnant and fall behind times in a market that is there for us to capitalize on. We must work together to capture our market share. We have a great industry and trade to market, and we must work together to fill the positions of our retirees. We must train our new apprentices to follow and succeed at building up the reputation the generations before them had as they relate to safety, quality, production, and professionalism. This market has become very competitive and the business is ever-changing. I see busy times ahead, which means there are opportunities for both the unions and their contractors to grow. With the war on talent, we need to diversify our skill sets. We must be ready to go out on a mainline pipeline project, station project, or get dispatched to a distribution project. To gain market share, we must all be flexible and work together. We must put safety in the forefront. Every day at the work sight, we must be our brother’s keeper. We have to speak up if we see something being done unsafely. We must insist on a quality product. As contractors and union members, we must be good corporate citizens and promote social responsibility every day. These are the attributes that build great reputations. The unions are big organizations that supply a workforce to many different facets of the industry. The PLCA and its contractors, along with the four General Presidents and their staff, plus a cast of many more business managers, agents, and organizers have given the pipeline industry a solid foundation. I’ve been fortunate to have grown up in the business, and it has given me a great opportunity to see the industry develop. I’ve worked beside some wonderful people. This industry is built on relationships. Good relationships build trust, and trust builds alignment. Relationships aren’t just handed out at the door; they are earned. The alignment between the unions and their contractors is critical for both organizations to succeed and their ability to survive. I’m proud to say we have a great relationship with the unions, and together we will get our market share. Check out this handpicked feature on FCR – First Call Resolution – Innovative support for innovative companies.